Tired of aliens and Pac-creatures? Looking for a self-contained game that young children can enjoy and teenagers find challenging? Try Turtles from Entex Electronics. Turtles is a full size (as opposed to pocket size) self-contained game that has become a favorite with our panel of play testers. It works on four C-cells or an AC adapter. Licensed by Konami, makers of the coin-op version of the game, Turtles features a valiant little turtle whose mission is to transport a covey of "turtlettes" (baby turtles? female turtles?) on his back from the "mystery squares" to a safety house." 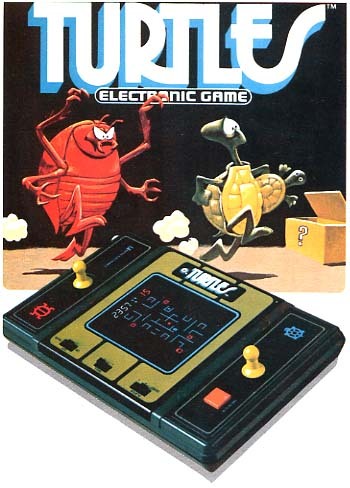 The turtle is controlled by a mini but very responsive joystick at one end of the game. You guide him around a not-very-intricate maze which is also inhabited by evil attacking beetles." At the beginning of each board, you are pursued by two beetles; two more are hiding in two of the eight mystery squares. When you poke your nose into a mystery square to release a turtlette, you may find that it is inhabited instead by a beetle. If you back away quickly enough, you can usually avoid being done in by the beetle, but it will soon enter the maze and join its mates in complicating your task. Your only defense against the predatory bugs are bug bombs. You start with three bombs and acquire three more each time you pass through the "flashing bonus square" in the center of the maze. To use a bug bomb, you simply press the square red button next to the joystick, and the turtle deposits one in his wake. When a beetle touches the bomb, he is temporarily immobilized--usually long enough for the turtle to get out of harm's way. This is worth 20 points. You can carry only one turtlette at a time, so you must deposit the one you are carrying in the safety house (30 points) before looking for another. When all six turtlettes have been rescued, the board clears and a new maze with eight mystery squares appears. There are two mazes which alternate, and you earn an extra turtle at 1000 points. Three sliding switches on the side of the screen offer three very useful selections. The first is a three-position switch which turns the game on in either sound or mute mode. The game plays one of the cutest tunes we have heard on a game, but it can get tiresome. In the mute mode, the game is not entirely silent; the player can still hear the tune and the auditory cues that signal various kinds of activity, but the sound is not loud enough to be a nuisance to parents, teachers, or others in the room. Another switch governs the skill level. There are two skill levels; on the second, the beetles move faster. Most of us found the speed on level 1 quite adequate for a spirited game. The third switch allows you to choose a one- or two-player game. The second player controls one of three beetles on the screen with a second joystick. Most of our panel preferred the one-player game, but we found that one player playing with the switch set on 2 could rack up some really high scores. As you have probably deduced, we like Turtles--very much. We found that players could improve their scores dramatically by practicing--a feature we always applaud--and that the game was considerably less stressful than many we have reviewed. It can be enjoyed by all members of the family, even those who usually shun electronic and arcade-style games. In conclusion, we have but one question for Entex and Konami: Why would any self-respecting turtle flee from an insect--"evil attacking" or otherwise?